Possibly more than any other Canadian destination, Newfoundland - the place - is integrally associated with the Newfoundland people. The beauty of one matches that of the other, and understanding either is something achieved only by visiting. Usually called simply "Newfoundland" (new-fen-land), the province's name is officially Newfoundland and Labrador. The name change in 2001 gave more equality to mainland Labrador, which is overshadowed by the more inhabited and popular island of Newfoundland. Newfoundland and Labrador is Canada's most easterly province and is a bit smaller than California and a bit bigger than Japan. Its capital city, St. John's, shares the same latitude as Paris, France, and Seattle, Washington. However, Labrador extends far north. The province's geographical highlights include its waterways and coastline, thousands of coastal islands, and mountainous regions. The Avalon Peninsula is the most populous region and includes the capital of St. John's. CapeRace Cultural Adventures and Ocean Quest Adventures are two excellent operators in the region. Moving north from Avalon, life gets even more laid back in the Eastern region. Eastern is also the gateway to the French islands of St. Pierre and Miquelon. Newfoundland's large Central region includes Iceberg Alley, Gander, and Fogo Island. Vast and untamed, Labrador attracts truly enterprising travelers. St John's is Newfoundland and Labrador's most populous city (pop.100,646); however, go 100 km around St. John's and you've got half the people in the entire province. The city combines urban convenience with small-town charm. Situated along Iceberg Alley, Twillingate is picturesque and charming. Trinity is an oceanside town with a rich history. Battle Harbour is a restored National Historic District of Canada. Scenic and historic, Brigus is an hour from St. John's and famous for its annual blueberry festival. Gander is a relatively large town that has historical significance as an important refueling point for trans-Atlantic flights. Newfoundland and Labrador tends to attract a more adventurous, outdoorsy type of visitor. Not that you can't find fine dining or a boutique hotel, but the major attractions of Newfoundland and Labrador are the natural surroundings, which are gorgeous, and the people, who are laid back and not pretentious. Some of the most popular things to do in Newfoundland and Labrador include scenic drives, whale watching, iceberg viewing, bird watching, kayaking, scuba diving, camping, and enjoying a sundowner with your mates at the end of the day. More than any other place in Canada, the people of Newfoundland are discussed and adored as much as the province's geographical setting and attractions. Being hospitable comes naturally to Newfoundlanders, and is not a show for tourists. Primarily of English, Irish, French, and Aboriginal heritage, the more than half a million people that call themselves Newfoundlanders are friendly, witty and quick to tell a story. Adding to their appeal is a unique hybrid dialect that - though at times difficult to understand - is something you'll want to learn, just to hang onto a piece of that Newfoundland charm. 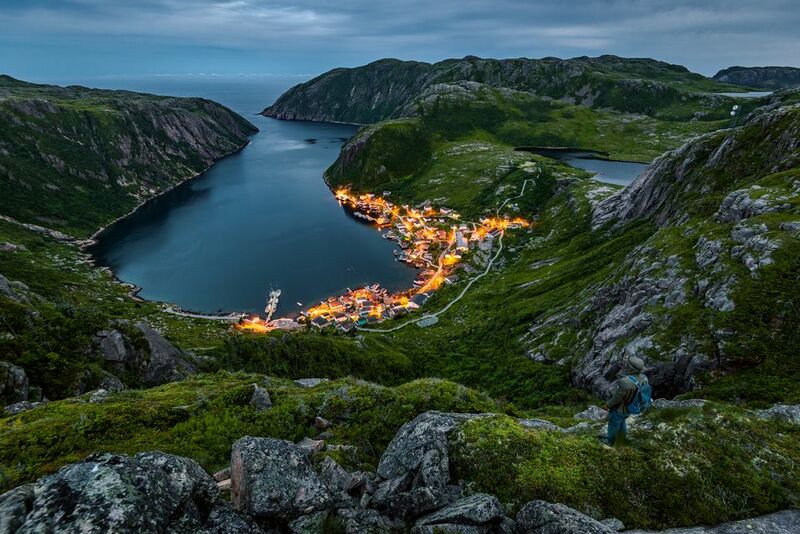 Newfoundland and Labrador's climate varies by region but often refers to Newfoundland and the populous region in and around St. John's, which has one of the mildest winters in Canada and comfortable cool-to-warm summers. Average summer temperature in St. John's is 16°C (61°F) while the average winter temperature hovers around 0°C (32°F). In Labrador, the winter climate is harsher, but temperatures can top 25°C (77°F) during the short but pleasant summers. Winter: Relatively mild winter in St. John's but significantly colder in Labrador. Newfoundland and Labrador is popular for snowmobiling, snowshoeing, cross-country and to a lesser extent downhill skiing. Dress for winter. Spring: Spring brings warmer weather as well as whales and icebergs. Pack layers and water-resistant wear. Include long and short of shirts and pants. Summer: Early summer, though still coolish is a great time to visit to still enjoy icebergs and whale migration and smaller crowds. July and August popular and warm but still bring jackets, long pants, and layers. Fall: Summer activities continue through September, like golf, hiking, and camping. But by October it's chilly. A short fall foliage season at the start of October. A Newfoundland and Labrador vacation requires planning. The province has lots of relatively uninhabited countryside to traverse and accommodation can be limited - especially in the summer. So plotting out your journey, complete with transportation and accommodation bookings can spare you disappointment and hassle. For a proper visit to Newfoundland and Labrador, allow two weeks. However, a less ambitious visit, say to St. John's and surrounding area, could be done in a week. For first time visitors, a packaged tour is an excellent choice. The people of Newfoundland are so much a part of the visitor experience that the more exposure you get to them the better, so consider turning over a good part of your first visit to locals. Car and ferry - Most car travelers access Newfoundland and Labrador by Marine Atlantic ferries, which operate between Nova Scotia and Newfoundland. Every day, year-round super ferries carry hundreds of vehicles and passengers to two Newfoundland entry points. Train - There is no rail service on the Newfoundland island and limited in Labrador. Cruise - Getting the perspective of Newfoundland and Labrador by water is a stunning way to appreciate the province's natural beauty. People from Newfoundland and Labrador don't shy away from a celebration. It's the province with the most holidays. In addition to all Canada's national holidays, Newfoundland and Labrador also has holidays on St. Patrick's Day (March 17 or nearest Monday), St. George's Day (April 23), Discovery Day (June 24), Orangemen's Day (July 12), Regatta Day/Civic Holiday (fixed by municipal council orders).